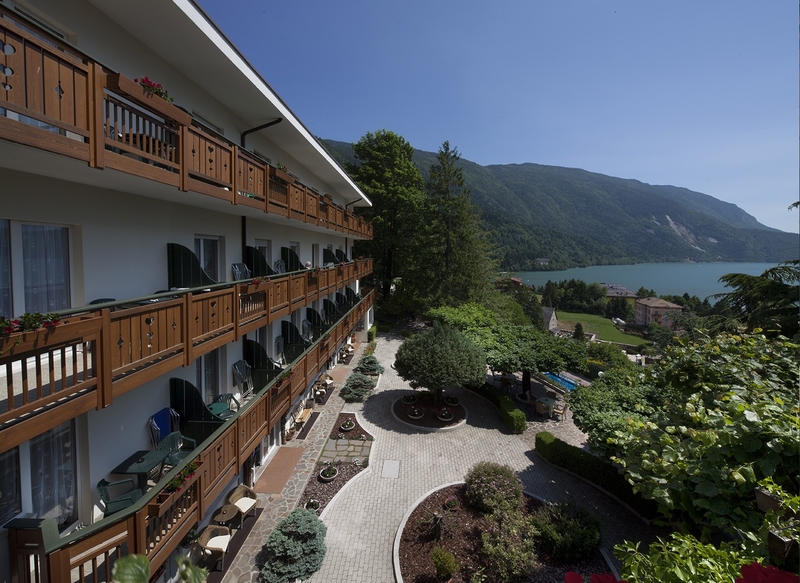 A seven-night half-board holiday based at Hotel Miralago in Molveno, a charming small town located on the shores of Lake Molveno at the foot of the Brenta Dolomites, 25 miles north-west of Trento. Perfect for lovers of nature, culture and history, the town itself has a 13th century church and a working watermill as well as water sports on the lake. Our itinerary takes us to historic towns, wine-tasting, mountain railways, funiculars, cable cars, a lake cruise and, of course, stunning mountain scenery. We begin in Bolzano, and a guided walk around its medieval historic centre. Today we ride on a cable car which affords us amazing views of the city and valley below us, before catching a train to Collalbo. Another mountain funicular on the following day, as we reach the 1,362-metre-high Mendel Pass. We finish this day at a winery, where we will have the opportunity to taste some of their excellent wines. We experience another scenic railway, the “Castles Train”, as we go to Caldes and Cles. Our Dolomites adventure continues with a trip to Lake Garda, a favourite holiday destination for Italians, with time in the charming resort town of Riva Garda and of course a cruise on the lake. Our final rail journey takes us from Trento to Bassano del Grappa, another very scenic line. As well as David, the PTG Tour Manager, we will also be accompanied by our local guide, who will lead our walking tours and explain the local history of the places we pass through. This is a half-board holiday. Each day we return to our hotel in Molveno in time for dinner, which is served in the hotel, and includes drinks with our meal. Day 1 Thursday (D) Several flight options from the UK with direct flights to Verona. Overland travel is possible too. Transfer to Hotel Miralago in Molveno, our home for the week. Day 2 Friday (B,D) This morning we travel north to the town of Bolzano. Here we are joined by our local guide for a walking tour around the medieval historic centre. Bolzano is the gateway to the Dolomites Mountains. Though it is part of Italy now, it used to belong to the Austro-Hungarian Empire, and as so many people still speak German as their first language, you’ll be excused if you forget we are in Italy! After time for lunch, we take the cable car up to Soprabolzano. This 10-15-minute journey affords wonderful views of the town and valley below us, and is an attraction in itself, not just a means of transport. After a short break at Soprabolzano, we catch our train on the Renon narrow-gauge railway to Collalbo. This metre-gauge railway, dating from 1907, is one of South Tyrol’s treasures, as well as being an important part of public transport in the area. We return to the hotel by coach, visiting the Earth Pyramids on the way. These are a phenomenon caused by erosion. When dry, the material is as hard as rock but, when wet, it becomes a clay-like mush which flows into the valley. Day 3 Saturday (B,D) We begin our day with a short journey to the lovely small town of San Antonio Mendola where our local guide leads us on a short walking tour. From there we climb over 850 metres on the funicular to Mendel Pass. This railway has a maximum gradient of 64%. At the top we have free time for lunch, and in the afternoon, after riding back down the funicular, we visit a winery near Mezzacorona where we will have an informative guided visit and of course the opportunity to taste their produce. Day 4 Sunday (B,D) This morning we transfer by coach to the railway station at Mezzolombardo, for our 45-minute rail journey northwards to Caldes. From the train, we have views of the Dolomites and some of the castles that are in this area. On arrival at Caldes, we visit one of those castles before catching a train to the town of Cles. The town is famous for an important archaeological find, the Tavola Clesiana, dating to the year A.D. 46. Cles, and the Val di Non, are also well known for their apples. Melinda is the brand name given to high quality apples exclusively grown in the Val di Non valley, and you will see many apple trees in the town. Now we have a guided visit to the Assessorile Palace, whose walls and ceilings are adorned with centuries-old frescos. Day 5 Monday (B,D) Lake Garda, the largest lake in Italy, is our destination this morning. The narrower northern part of the lake is surrounded by mountains from the Monte Baldo range, while in the south, the wider part of the lake is surrounded by morainic hills that were left after the melting of the glaciers. Flourishing vegetation – mainly olive and lemon groves, palms, cypresses, oleanders and orange trees – along with majestic landscapes make this lake the most charming in Italy. We visit Riva Garda, at the northern end of the lake. This charming resort town is located at foot of high mountains, and also has an interesting historic centre with narrow streets and alleyways and an abundance of excellent restaurants. We will have a short cruise on Lake Garda. Day 6 Tuesday (B,D) Our final train trip of the holiday starts at Trento, where we catch a train along the scenic branch line to Bassano del Grappa. Our two-hour train journey takes us past lakes and along valleys between high mountains. As well as an attractive historic centre a short walk from the railway station, the town boasts a covered wooden pontoon bridge designed by the architect Andrea Palladio in 1569. The bridge has been destroyed many times, most recently during World War II, but it has always been rebuilt. Return to Trento by train at the end of the day, with our coach waiting to take us back to Molveno in time for dinner. Day 7 Wednesday (B,D) The last day of our holiday is a free day for you to explore on your own. Perhaps you wish to relax by the lake or even walk round it (7 miles), hire a rowing boat or simply soak up the beautiful mountain air and scenery. Or head up into the mountains on the cable car that leaves a short distance from the hotel. The first route rises 460 metres to Pradel, with a further 180 metre rise on the second, to over 1,500 metres (5,000 feet) above sea level, with stunning mountain views from the moment you set out. The day is yours, and our local guide will also offer suggestions depending on your abilities and interests. Day 8 Thursday (B) This morning we return to Verona Airport for our flights home. Or remain in Verona for two extra nights at the Hotel Leon d’Oro (or similar) with free time to explore this most romantic of cities. Lake View Rooms: Rooms with a view over the lake are limited so book early to guarantee the best rooms. This is a relatively easy tour, with very little “compulsory” walking, though there are some short optional walking tours. We are picked up from and brought back to our hotel each day by our own luxury coach (which will also meet us at the airport on arrival and take us back for our flights home), and dinner is in the hotel each evening. To enjoy the tour to the full, you need to be able to get on and off our coach and also trains and a cable car. Fly out on Wednesday 8th May for night at the Hotel Leon d’Oro (or similar). After the main tour you have two more nights in Verona before flying home on the 18th May. Fly out on Saturday 4th May for 5- nights at the Hotel Leon d’Oro (or similar) in Verona. After the main tour you have two more nights in Verona before flying home on the 18th May. All extra nights in Verona are on bed and breakfast basis.